Greetings from the Association of the United States Army (AUSA), our Army’s association for education and professional development, and a major supporter of the Army’s Soldier for Life efforts. This past month I had the honor of traveling with an amazing group of six soldiers to Kuwait and Afghanistan as part of an initiative called Operation Proper Exit. Staff Sgt. George Perez, second from left, Master Sgt. Leroy Petry, third from left, and Spc. Matt Stubblefield, second from right. 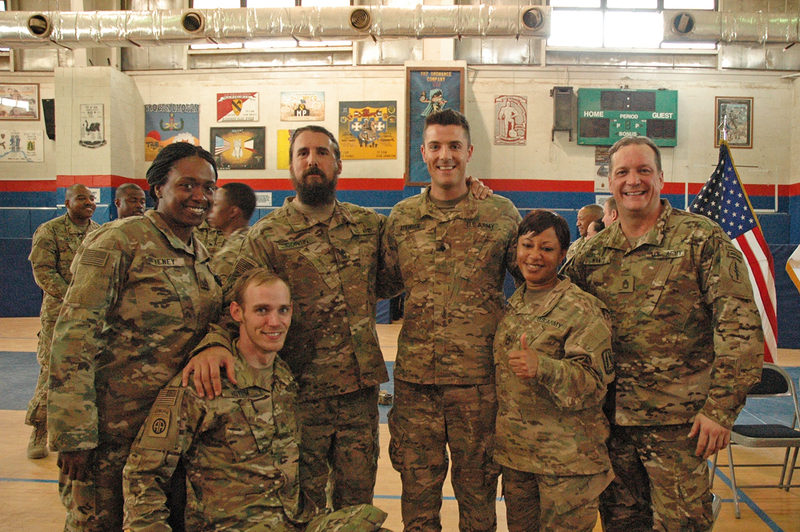 This visit gave me the opportunity of a lifetime – the chance to see the changing and ever-positive outlook on life from a warrior’s perspective. This perspective originates from the heart and soul of men and women in combat and from their willing obligation and determined commitment to our nation. No regrets, no remorse, they are always grateful for the opportunity to serve our nation and with the warriors who stood and continue to stand shoulder-to-shoulder with them. Operation Proper Exit is one of many initiatives of the Feherty’s Troops First Foundation. This foundation was co-founded by David Feherty and Rick Kell in August 2008 to provide programs for wounded warriors and their families that are focused on relationship building, mentoring, reintegration and looking forward. Our veterans – soldiers, sailors, marines, airmen and coastguardsmen – have often returned to distant battlefields to honor fallen comrades and recall the memories of those unique locations that have occupied their dreams for many years. Veterans who landed on Normandy beach, or led a combat patrol to retake Seoul, or defended Tan Son Nhut Airbase during the Tet Offensive, return to those battlefields to honor their buddies, while others seek to make sense and find a purpose for this chapter in their lives. For the last 16 years, warriors severely wounded in combat, evacuated from theater during their tour of duty, waking for the first time in a hospital bed at Walter Reed or Brook Army Medical Center, are searching for answers and the opportunity to put behind the past and move forward. Operation Proper Exit serves that purpose. They have the opportunity to visit hospitals where they were treated and specific areas where a warrior was maimed for life, and to psychologically close this chapter and leave that location under their own terms and conditions. Operation Proper Exit provides these warriors seven to 10 days in theater, to piece together the sights, sounds and smells of the battlefield and, most importantly, return to the brother and sisterhood of the comrades they left behind. Each of the previous 20 Operation Proper Exit tours – 10 to Iraq and 10 to Afghanistan – were unique in its own way. This trip, number 21, was unique in and of itself, unique for the six warriors with their own personal stories who had the opportunity to return to theater, and unique for those warriors deployed who had the opportunity to meet and learn their stories. Making the journey from their hometowns across the country, the six warriors rendezvoused in Washington D.C.
Sgt. Will Hoyum, second from left, Master Sgt. Chris Corbin, third from left, and Sgt. 1st Class Randy Nantz, far right. The Army chief of staff, Gen. Mark A. Milley and his wife, Hollyanne, hosted the six warriors at a luncheon before their departure to Camp Arifjan, Kuwait. Everywhere this group traveled during their visit, each location was met with a gathering of troops and civilians applauding the arrival and the return of these warriors. Making this trip to Afghanistan for Operation Proper Exit 21 was Spc. Matt Stubblefield, U.S. Army retired. Matt was assigned to D Company, 1st Battalion, 26th Infantry Regiment (Blue Spaders), 3rd Brigade of the 1st Infantry Division based out of Fort Knox, Ken. Serving as a M-ATV (Mine Resistant Ambush Protected (MRAP) All-Terrain Vehicle) driver in Narizah, Afghanistan, Matt was seriously injured by an Improvised Explosive Device (IED) on April 3, 2011. Six years have passed since that fateful day and his injuries and the many surgeries that followed resulted in the amputation of his left leg below the knee and a damaged right leg limb that today requires a permanent supporting brace. Looking as young as a 16-year old and getting teased for his looks on occasion, the 26-year-old had one special request when asked by Maj. Gen, J.T. Thompson, commander of the 1st Cavalry Division: he wanted to drive a M-ATV again. That special request became a reality during the visit when an Air Force security team securing the airfield equipped with M-ATVs made a dream come true. Looking back to that fateful April 3 day, Stubblefield had been in country only 90 days, he was left unconscious sitting at the wheel of his M-ATV only to gain full consciousness and awareness at Walter Reed Hospital. Coincidently, while touring the hospital at Bagram Airfield, Stubblefield met a trauma surgeon and a nurse who worked on him the evening he arrived injured six years ago. Both medical professionals, now on another tour of duty, remembered him as they walked him through the emergency room where they performed life saving measures and prepared him for medical evacuation to Landstuhl, Germany. Also, returning to Afghanistan for the first time was Sgt. Will Hoyum, U.S. Army retired. Hoyum was serving with A Company, 307th Brigade Support Battalion, 1st Brigade of the 82nd Airborne Division. Assigned as a truck driver conducting recovery operations of inoperative or severely damaged vehicles from the battlefield, Hoyum had a fateful encounter with an IED on June 19, 2012. The injuries sustained from the homemade bomb left him paralyzed from the chest down. Now confined to a wheelchair, this warrior at heart never accepted defeat. Hoyum was determined to not let his lack of mobility in this austere environment keep him from this lifetime opportunity. The warriors of this band of brothers all took turns grabbing a leg and an arm to help Hoyum on and off ground and air transportation. He participated in every activity on the itinerary. Whether it was sitting in the cockpit of a C-17 for takeoff, wearing body armor and a helmet again, or riding in the back of an MRAP, Hoyum got to feel, smell and see many of the memories he left behind. Staff Sgt. George Perez, U.S Army retired, was serving with B Company, 1st Battalion, 504th Parachute Infantry Regiment of the 82nd Airborne Division on Sept. 14, 2003 when he sustained multiple injuries from an IED, including the amputation of his left leg below the knee. But Perez is very unique as he continued his service in the Army after rehabilitation at Joint Base San Antonio and Walter Reed. Perez rejoined the 82nd in 2004 where he became the first amputee to certify for static line jumps. Amazingly, this warrior returned to combat with the 82nd in Afghanistan in 2005, and ultimately was selected by the Golden Knights, the Army’s elite parachute team. For Perez, this trip was also an opportunity to return to the brotherhood of warriors he left behind. Sgt. 1st Class Randy Nantz, U.S Army retired, was serving with 5th Special Forces Group on Dec. 22, 2006, when an Explosively Formed Penetrator (EFP) ripped through the door of his up-armored High Mobility Multipurpose Wheeled Vehicle (HUMMV). The molten dart ripped through his lower body striking the fuel tank under the driver’s seat, leaving his legs covered with burning fuel. Nantz’s injuries sustained from the blast included 22 percent of his total body surface with third degree burns, amputation of his left leg below the knee and severe damage to his right leg and lower extremities. Joining the Army immediately after the attacks on 9/11, Nantz’s goal was to serve his country as an infantry soldier. In his early 30s when he joined the Army, Nantz quickly demonstrated his fitness and leadership abilities, ultimately resulting in his qualification and selection for the Special Forces. Master Sgt. Chris Corbin, U.S. Army retired, was serving with 7th Special Forces Group in Hyderabad, Afghanistan on Feb. 17, 2011, when he stepped on an IED resulting in the bilateral below-the-knee amputation of his legs. For Corbin, this was his second visit to Afghanistan as part of Operation Proper Exit. Sporting a beard and a pony tail, and looking like one of the stars from Duck Dynasty in an Operational Camouflage Pattern Army Combat Uniform, Corbin’s vast experience from more than 21 years of service and three combat deployments was evident throughout the trip. With a promise to pay homage and respect to a close personal friend and Special Forces warrior who was killed recently, Corbin returned to these distant battlefields for him and his friend’s family. “We were injured, but we are still soldiers and want to serve,” said Corbin during one of his talks with troops. The sixth warrior on this trip was also a return visitor to Afghanistan and the battlefield that cost him his right hand. Master Sgt. Leroy Petry, U.S. Army retired, and Medal of Honor recipient, works as a military liaison for Feherty’s Troops First Foundation. Petry devotes his time and energy supporting programs like Operation Proper Exit that focus on improving the lives of veterans and our military. As each military unit and combat outpost was visited by these six warriors, Petry’s presence on the list attracted an audience of both military and civilian fans to hear him and each of these soldiers tell their stories. Petry was serving in the Paktika Province on May 26, 2008, with the 2nd Battalion, 75th Ranger Regiment, when, during a night mission, he sustained a gunshot wound through both his left and right upper thighs. Continuing to lead his soldiers in the fight against a determined enemy, Petry grabbed and threw away an enemy grenade that had landed next to his soldiers. The detonation of the grenade resulted in the amputation of his right arm below the elbow. Petry applied his own tourniquet and continued to lead his soldiers until the mission was completed and the unit extracted. Every gathering of soldiers and civilians this group encountered left the venue standing a little taller and feeling proud of their contributions to our nation and Afghanistan. One of the highlights of the visit to Kabul was a ceremony hosted by Gen. John W. Nicholson, commander, Resolute Support Mission, and U.S. Forces Afghanistan, and Command Sgt. Maj. David M. Clark. The ceremony gave each of the returning warriors an opportunity to tell their stories to the audience, and the opportunity to meet and honor a group of four bilateral amputee Afghan soldiers. Attending the ceremony with his Afghan soldiers was former Sgt. Maj. of the Army Roshan Safi, who spent a decade in this leadership position before moving to serve as the senior enlisted advisor to the president of Afghanistan. For those on the sidelines, seeing these American and Afghan soldiers sitting together and sharing a meal and a few stories with each other demonstrates the bond among warriors. The event also reminds us of the sacrifices of blood and treasure our two nations have contributed. 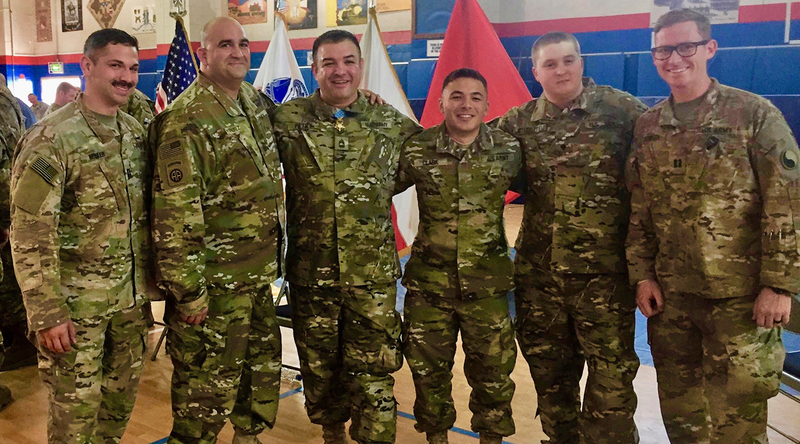 For the returning six warriors, there is no doubt these heroes are soldiers for life, dedicated Army alumni who will forever tell the soldier’s story in those circles they travel. A special thanks to Rick Kell and retired Command Sgt. Maj. Tom Capel for their continued service and commitment to Feherty’s Troops First Foundation and all the things like Operation Proper Exit, they provide for our warriors. Also, a special thanks to Col. Adam Rocke, director of the Soldier for Life Program, who joined the six warriors on this trip and was instrumental in the successful outcome of this visit. Now more than ever America’s Army needs AUSA, and AUSA needs your membership support.